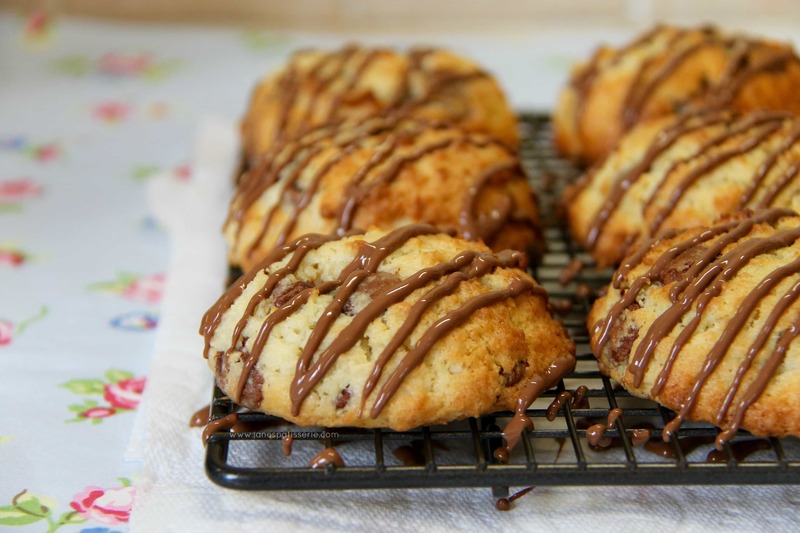 A twist on a Scone, a Rock Cake, and a Coconut Macaroon – delicious. I love coconut, and I love chocolate – The combination of them together is DELICIOUS! I was asked by someone I know to make something involving them both, but I had no clue what, so I decided to make a mashup of all things yum and got these! The name ‘Rocks’ implies they’re hard, but they’re not at all! They are based on Rock Buns which traditionally have raisins in for example, not coconut or chocolate! I wasn’t 100% on if this name suits them – so apologies if not, I just know they are extremely yummy! The chocolate makes them so nice and gooey, but the coconut flavour cannot be topped – its delicious! You can make these bigger if you want, I used a cookie scoop that holds 2tbsp but they’re still quite small – doubling them is easy enough, and baking them for about another 5 minutes! I seriously want to make these again already, but alas I have many more requests to complete! I recently put up my recipe for my Coconut Chocolate Blondies and they’ve been a hit – they’re similar to this, but more cookie/brownie like – both are perfect for Coconut lovers! Seriously though, I hope you love these! Let me know how you get on! 1) Preheat your oven to 200C and line two baking trays with parchment paper. 5) Bake them in the oven for 10-12minutes until golden! Leave to cool on a wire rack! These in my mind are perfect the way they are – they’re not hard but soft and gooey and delicious! You can use other types of chocolate however, all work equally well! These will last for 2-3days after baking, and are super yummy when fresh! Older Next post: Salted Caramel Nut Slice! Newer Previous post: Homemade Summer Berry Jam! Definitely not cadburys – it’s not really ‘chocolate’. You should use plain and basic dark/milk/white, usually supermarket own brands are best! Hi I made these today with my daughter. They are so yummy! Just one thing thoughis they spread a bit unlike yours. Any reason why? You will have overdone the mixing of the dough and caused them to spread. Also, if yours were larger they would have spread more! Delighted to have found your blog, Jane! Your recipes look delicious! I made Cornish fairings yesterday, but the tin is already looking half-empty so these should be next on the list, before lemon drizzle cake – a special request – on Thursday. I’m sure there’s time to squeeze these in between now and then…? There is always time to squeeze in more cake and treats!! 🙂 sounds brilliant! These look amazing. I’m definitely trying these ! I love the name and they sound really different and yummy! I’ve recently developed a new – found appreciation for coconut and the name, dare I say, rocks! They look delicious!